Detectives investigating the killing of a mother of four want to trace a man she was seen with on the day she went missing - Boxing Day 2018. 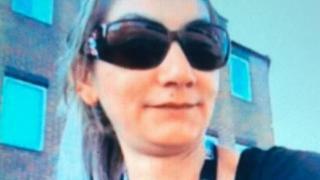 The naked body of Alena Grlakova, 38, was discovered concealed in a dried-out stream bed in Rotherham on 9 April. Police found her body near the Fitzwilliam Arms Hotel, where she was last seen alive. Ms Grlakova was seen with the man on Scrooby Lane going towards Mangham Road at about 20:30 GMT on that day. Det Ch Insp Mark Oughton said officers were keen to hear from anyone who had seen Ms Grlakova on Boxing Day in the Parkgate area, particularly this man. He said: "Was that you? Were you with Alena that evening?" A 45-year-old man who was previously arrested in connection with Ms Grlakova's death has been bailed pending further inquiries. Meanwhile officers are still trying to find her sweatshirt with "Little Black Sweat" written on it and her black tracksuit bottoms with white stripes down the sides. Ms Grlakova was also wearing blonde clip-in hair extensions. They are also missing. Officers think these items may still be in the area. Mr Oughton said the local community could have information vital to the inquiry. He said: "I do believe answers around what happened to Alena lie within the local community and I'd encourage people to keep speaking to us, if they have any information or concerns. "Any information, no matter how small, could prove to be incredibly helpful."